In my previous visit, I went to the Hout Bay Museum. This time, I was at the Cape Medical Museum, a museum dedicated to the history behind medicine timeline in Cape Town, and the Western Cape at large. 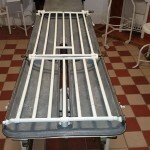 Located at the Old City Hospital Complex, Green Point (Cape Town), South Africa, the Cape Medical Museum is home to many old medical related tools and devices, some dating back into the early 1900s. 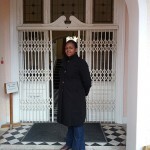 Bongi, at Cape Medical Musuem entrance. With the help of Bongi, the tour guide at the museum, updates could be made to the Cape Medical Museum article on Wikipedia. A dedicated category on Wikimedia Commons was created to house the images of the museum. The manager of the museum also has showed interest in helping improve the content about the museum on Wikipedia as well as Bongi. We hope to see more content added to the article appropriately in the near future, thus providing rich knowledge for viewers, readers and researchers. View all the donated images on Wikimedia Commons in the Cape Medical Museum Category. 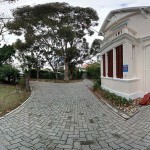 See photospheres of some of the rooms at the Cape Medical Museum.